Review of Samuel Smith’s Yorkshire Stingo | Beer Apprentice - Craft Beer News, Reviews, Interviews and Info. 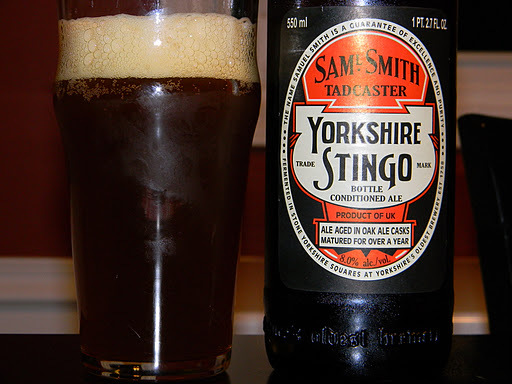 For today’s craft beer review I thought I would sample another beer from the great Samuel Smith’s Old Brewery (Tadcaster) located in Tadcaster, United Kingdom called the Yorkshire Stingo. Like all Samuel Smith’s brews, I’m sure this one will be worth it’s weight in gold. Let’s read the description from the website, samuelsmithsbrewery.co.uk. This beer has an ABV of 8.0% and it comes in an 18.7 oz. bottle. It poured a brownish to dark copper color that seemed a little bit cloudy. Orange highlights were shown around the edges and around the bottom of the glass. The head was off white, mostly creamy and smooth with a few large bubbles hanging around. It was nicely sized from an easy pour and it had above average retention and lacing. The nose was dominated with characteristics of dried, dark fruits. Hints of dried apple chips, raisins and plums. Lying underneath the sweet fruits were very nice “woody” tones intermingled with caramel and toasted biscuits. As the brew warmed, the fruits started to become more forceful, which created a Christmas”y” type of aroma. I didn’t detect much (if any) alcohol on the nose, but otherwise very nicely balanced and even I thought. Within the taste, I, once again, obtained the dried fruits, but this time I did notice a significant Bourbon flavoring that imparted more of the “woody” tones that I found in the aroma. Some caramel and toffee were acknowledged, however they seemed to be a bit more relaxed than what I had anticipated. The taste was rather sweet and fitting and the toasted, dark breads and biscuits helped complete this very good, harmonized flavor. The mouthfeel was medium to medium/full, chewy, dry and smooth. Some welcome alcohol warmth teetering on a slight burn was felt at the back of the throat. The palate was covered justly until the next sip. Well…. this is another very good, solid effort from the Samuel Smith’s Brewery. Very enjoyable. It’s one geared more for sipping in my opinion. It’s very sweet and it filled me up with ease, so the drinkability factor is not as high as some of their other products, but I could have it again without any problem. I don’t know that this is a brew that I could drink everyday, but maybe more along the lines of a beer that I could handle a few times a year. I definitely think that it’s worth a try and one that garners plenty of complexity for a lengthy discussion with friends. Thanks for reading and commenting folks. I truly appreciate it. Until next time.